The File Transfer Protocol (FTP) is one of the original internet protocols used for the transfer of large files. The modern internet has a number of tools to transfer files such as email attachments and various transfer websites, but those methods have their limitations. FTP, with added security such as that offered in SFTP and FTPS, is still one of the best tools for transferring files. But, to use it, you’ll have to set up an SFTP server. Here’s our top list of the 10 best SFTP servers out there. These terms all vary by one letter, but that letter is important. FTP File Transfer Protocol: The original protocol and its major limitation is that it sends logins and data unencrypted. Login information, as well as the file itself, are sent “in the clear” in plain text that an observer can see. FTPS File Transfer Protocol Secure (also known as FTPES): This is secure FTP, where the S in this case represents Transport Layer Security (TLS) encryption. This is essentially a basic FTP server that knows how to negotiate an encrypted TLS tunnel to transfer data through. SFTP Secure File Transfer Protocol: This is also secure FTP, but in this case the S represents Secure SHell (SSH). This isn’t really an FTP server at all. Rather, it is an SSH server that understands FTP commands. Login information and files are transferred encrypted via SSH. To make matters even more confusing, the original intention of the abbreviation SFTP was Simple File Transfer Protocol defined by RFC 913, but has been relegated to “Historic” status and no longer used. SCP Secure Copy: This is not an FTP protocol, but it is widely used to securely transfer files, so it bears mentioning here. SCP is a very simple file copy from one machine to another using the SSH protocol. The FTP protocols have a wide range of file management abilities that SCP does not. Confusingly, a GUI utility that implements the SSH File Transfer Protocol is termed an SFTP client although it can also be an SFTP server. The SFTP client designation signifies that this piece of software initiates connections. It is also called a server because it is usually part of the file server where backup configurations are stored. SCP is just a copy function. SFTP is has its own environment. It allows you to move files on the remote system, change directory and even create directories on the remote host. Both SFTP and SCP use the same security procedures to enforce user authentication and protect transmissions with encryption over the connection. However, SFTP gives the user muh more access to functions to manipulate the operating system. You would be more likely to use SCP for straightforward file transfers. As both systems require user authentication, there is a risk if you put either into a batch job, because you would have to supply a username and password in the call to the command. However, you could limit the potential that anyone discovering the user account on the remote system by creating a restricted access user account for that computer, which prevented anyone accessing that account from getting out into any other directory other than the account’s home directory. However, this strategy would negate many of the functions that provide SFTP with its advantages. A secure transfer to a remote host carries less risk if it is carried out with SCP, because there is no command language incorporated into that protocol. SFTP is more suitable for use by a systems administrator performing interactive manual tasks and transfer on a remote computer. 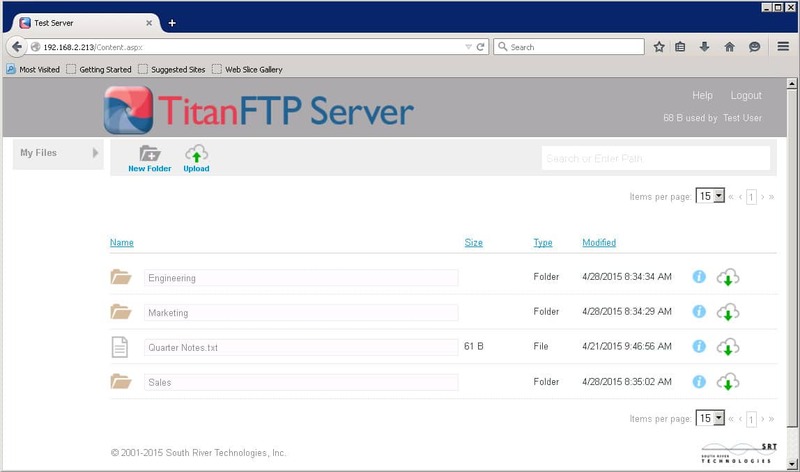 Titan FTP Server supports regular FTP, as well as FTPS and SFTP. It is HIPAA compliant, which makes it ideal for use in hospitals and government agencies across the globe. It runs on Windows Server 2008 and Windows Server 2012. In addition to simply providing file transfer services, Titan FTP server bundles some security measures which can defend against brute-force attempts, and full auditing capabilities so system administrators know what is happening on their servers. Account management can be tied into Windows NT/SAM authentication in the Enterprise Version, and fine-grained account management such as automatic account expiry is included. Titan offers a 20-day trial of its FTP server. Ready to try the best SFTP Server for secure file transfers? Titan FTP Server is a product of South River Technologies.